Schmidt & Bender Police Marksman II 6x42 Fixed Power Riflescope is simple and practical. This Schmidt and Bender fixed power riflescope allows you to hunt with the world's finest optics at a reasonable price. Utter simplicity, ruggedness, reliability and it is streamlined as well as efficient. Its 42mm objective lens providing some of the highest light transmission levels ever achieved, yet presenting a low profile. This Schmidt & Bender Riflescope is built upon the smaller 30mm tube, allowing a wider choice of rings and mounting options. The fixed 6x magnification is designed for precise shooting at long ranges, yet still offers a wide field of view. We have arranged to have this great scope built for you for $1999.99. We are now accepting orders for June delivery. This is a limited run so if you are interested please contact us, 516-217-1000, with any questions or to place an order. I think it is a fair statement that "this will be the finest fixed 6x42 scope available on the market". Eye relief: 90 mm / 3.54"
Diopter: -3 dpt. bis +2 dpt. I just spoke with S&B. The Windage will be capped and the Elevation will be exposed. 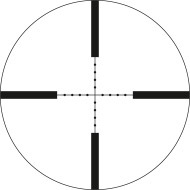 This is a Made in Germany scope.